The event hasn’t even jumped off yet, but WEC 41 can officially go down as a success. The organization has announced that Arco Arena, site of the highly anticipated featherweight rematch between champ Mike Brown and former king Urijah Faber, was forced to open up additional seating due to overwhelming demand. WEC co-founder and general manager Reed Harris told MMAjunkie.com that the organization easily sold out the event, forcing the venue to make approximately 1,000 more chairs available. With the reconfigured layout, Sunday’s show will be able to house roughly 12,000 screaming MMA fans. Faber, the WEC’s poster boy, lost his strap to Brown at WEC 36, one of the biggest upsets in MMA history. No doubt that Brown has game, but he entered the fight as a 4-to-1 underdog against the best 145-pound fighter in the world. Ironically, Faber lost his title attempting an unorthodox, high risk maneuver, a move similar to the trendsetting ones that have helped make him the success he is today. Brown ended up countering with a wicked right hook to Faber’s grill, knocking him completely on his back. 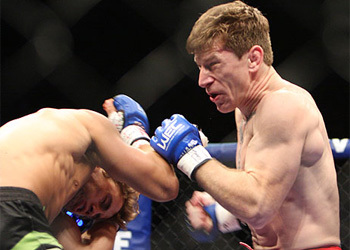 He pounced on him, and a few shots to the dome later Brown’s reign as featherweight king began. For those of you not in the Sacto area, Versus Network will be airing the main bouts beginning at 9PM EDT/PDT.